“The War Games” (Episodes 1-5) / "“The War Games” (Episodes 1-5)" / "“The War Games” (Episodes 1-5)" / "“The War Games” (Episodes 1-5)" / "“The War Games” (Episodes 1-5)"
At the end of the 1960s, Doctor Who was in the throes of its second major crisis, and so by extension was the Doctor himself. After three years, Patrick Troughton had decided he wanted to try other things, which meant that for the second time, the show would need to figure out how to get along without its lead actor. That in itself wasn’t such a devastating problem, since William Hartnell’s departure in “The Tenth Planet” had led to Doctor Who’s uniquely freeing solution to the problem of change, the concept that the Doctor periodically regenerates into a wholly new body with a new personality. The problem was that this time, the show itself was on the rocks. Ratings were way down—from 12 million for “The Dalek Invasion Of Earth” to 3.5 million for the least-watched episode of “The War Games,” episode eight—and there was general agreement that something major had to change, beyond even another regeneration, if Doctor Who was going to survive. “The War Games”—the last appearance of the Second Doctor as the lead character of the show—was not meant as the story that would solve Who’s problems, or even set up that solution. Just the opposite. By the time Terrance Dicks and Malcolm Hulke wrote the script, the producers had already figured out how to reinvent the series: The Third Doctor would be exiled to Earth starting with season seven’s “Spearhead From Space,” which would allow the show to use familiar modern-day settings to a) bring in greater relevance and sophistication to the storylines, and b) be made more cheaply. And the necessary groundwork for the Doctor joining UNIT had been laid down in “The Invasion” earlier in season six. 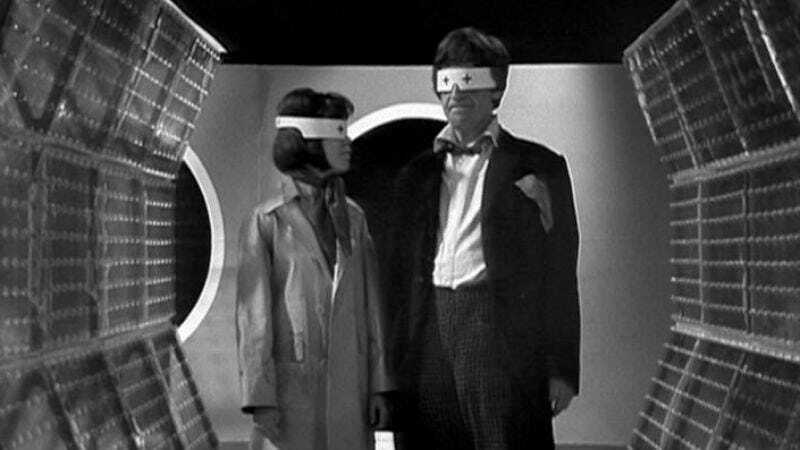 So “The War Games” didn’t have to worry about any of that—instead, its focus is on capping off the Second Doctor era itself, and ending his story in such a way that justified the radical changes of the next season. To that end, Dicks and Hulke confronted the Doctor with a situation that was a dark mirror of his own habit of interfering in the natural course of history, and what’s more, was too much for him to handle. The Doctor fails, and he’s forced to face the consequences of his failure when he’s caught and put on trial by the Time Lords, the people he’s been running away from since before the series began. But I’m getting ahead of myself. As I did with the eight-part “Invasion,” I’m breaking up the four-and-a-half-hour, 10-part “War Games” into two halves. Because of the way the story divides itself, this half of my writeup on “The War Games” will necessarily be a little inconclusive, since the story is very much still building up at the end of the fifth episode and hasn’t even introduced the War Lord, who’s in charge of the alien plot at the heart of the story. 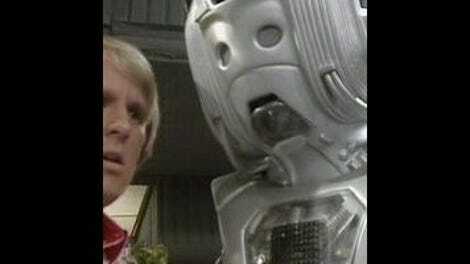 (It has introduced his arguably more important underling, the War Chief, who is a Time Lord renegade in the Doctor's own mold.) And of course, most of the stuff that makes “The War Games” such a crucial part of Who’s overall development happens in episode 10, so it’ll wait until the next installment. “The War Games” is often seen as essentially two stories, the first eight and a half episodes dealing with the Doctor solving the problem of the war games themselves, and the rest dealing with the Doctor’s capture and trial by the Time Lords. Episode 10 in particular casts such a long shadow over the series as a whole that it’s easy to dismiss the previous nine—it’s no exaggeration to say part 10 of “The War Games” is more important than any previous episode of Doctor Who with the exception of the pilot episode itself, “An Unearthly Child.” Still, despite its chief problem that (like many of Who’s longer stories) it could probably have been told in half the time, the rest of “The War Games” is easily one of the best serials of the black-and-white era, and an absolutely must-see for anyone wanting to understand how the Doctor’s personal story unfolds over the course of the series. And I think it works better as a complete 10-part story than it’s often given credit for. There’s a definite sense of progression running through this that ties into what the Time Lord trial is all about, and the situation the Doctor lands in at the beginning of episode one is significantly related to why he’s found guilty in episode 10. There’s a moment in Star Trek III when Uhura defiantly breaks the fourth wall to declare, “This isn’t reality; this is fantasy.” The implication is that she lives in a universe where the good guys get to have adventures and save their friends and their worlds from the forces of evil, and that it’s better than reality because reality can be mundane and harsh and unfair. The Doctor lives in a similar universe to Uhura’s, where the lines between good and evil are clearly drawn and there’s generally no problem that can’t be resolved in four or six episodes. Sure, he’s constantly battling against Cybermen and Ice Warriors who want to destroy the Earth, but that’s all part of his milieu. It’s nothing he can’t handle. It’s fantasy. He’s living proof of Hunter S. Thompson’s adage that when the going gets weird, the weird turn pro. And where do the Doctor, Jamie, and Zoe land in episode one of “The War Games?” Reality. One of reality’s starkest and deadliest places, for that matter, the grim killing fields of World War I in 1917, smack in the middle of No Man’s Land between the British and German trenches. To accentuate the point, the opening scene begins with the Doctor and Zoe sharing a bit of good-natured, harmless laughter at Jamie’s expense, after he steps out of the TARDIS and directly into a mud puddle. Within a couple of minutes, a hail of mortars and machine-gun fire nearly kills the three of them, and things have turned deadly serious before they’re saved by a plucky nurse and square-jawed British lieutenant. It’s significant that the Doctor shows no indication that he wants to stick around and stop this war the way he’d stop an invasion of Ice Warriors. This is too real; he just wants to get in the TARDIS and get the hell out of there. Right away, there’s a subtle hint that something strange is going on, when Lady Jennifer admits she doesn’t know exactly where she is. But the emphasis is on realism instead of the usual Doctor Who sci-fi atmosphere, which significantly implies to the audience that “The War Games” will be a throwback to a First Doctor-style historical story. That’s important, because the historicals of the 1960s operated by different rules than the sci-fi stories—generally, the TARDIS crew would visit some point in Earth’s past—like the Roman empire or Marco Polo’s journey to China—and they’d be forced by writerly fiat to play by the rules of that era, usually by being separated from the TARDIS and losing access to the futuristic high-tech that would otherwise make their survival easy. The precise details take a while to unfold, but eventually we learn that this isn’t 1917 Europe, but some unknown alien planet where human soldiers from many different time periods have been kidnapped and forced to slaughter each other as part of some enormous and ghastly experiment run by Smythe and his superiors. And it’s all made possible by another Time Lord renegade calling himself the War Chief, who has built TARDIS-like time machines (called SIDRATs) for his bloodthirsty allies—which makes this a story about the consequences of messing around with history, something the Doctor does all the time, only this time he sees the situation from the outside. This isn’t the first time the Doctor’s met a fellow renegade, having defeated the conniving but endearingly incompetent Monk in “The Time Meddler,” but the War Chief is clearly a greater threat. He’s allied himself to a group of people with bad intentions, and his plan is causing the needless slaughter of thousands of soldiers. The slow pace is partly time-filler, in the grand Doctor Who tradition of dragging things out to pad the running time, but it’s done far better here than the shorter but sometimes excruciating “Dalek Invasion Of Earth.” Partly that’s because Dicks and Hulke are better writers than Terry Nation and give us better action sequences and more interesting side characters, but they’re also taking the time to carefully shift their footing from what seems to be a completely real Great War setting into the weird psychedelic sets of the alien central command and the total breakdown of normal chronology seen in the ragtag resistance force made up of soldiers from a dozen different decades who should never, in any sane world, have been able to meet each other at all. As the story progresses, the Doctor begins to realize just how monstrously the aliens’ time-meddling and brainwashing is harming the humans they’ve kidnapped. When the likable Lt. Carstairs is turned paranoid and violent by his mental conditioning and threatens to shoot Zoe, it’s genuinely shocking and grim. Along with the brief, understated shot of the fake British and German generals casually planning together how they’re going to slaughter each other’s men, it’s the most potent scene in the first half of “The War Games.” It should hardly be surprising that a TV show made in 1969 would be openly critical of the concept of war, since even in Britain the Vietnam War was deeply divisive and controversial. The choice of war here is therefore important: Vietnam was almost certainly too hot a topic to bring up directly, but it hovers in the background like a specter. The war we actually get dropped into is World War I—the war that even bloodthirsty warmongers tend to think was pointlessly brutal and wasteful of human life. (Something similar goes on in the sitcom M*A*S*H, in which Hawkeye and company are constantly hashing out Vietnam-era social conflicts in the middle of a Korean War setting.) It’s worth noting that among the story’s satiric jabs at the dehumanizing brutality of modern warfare, it’s not just the aliens who have developed the callous bureaucratic mindset that allows such indiscriminate killing: Smythe’s human assistant Ransom complains that “in the last push, we lost over 100 shovels,” showing no concern at all for the soldiers killed in that push. It’s also striking how often the Doctor’s first reaction here is to try to run away—he does it the minute he realizes they’ve landed in what appears to be World War I, the minute he sees a Roman legion heading for him at full charge, the minute he sees the War Chief and they recognize each other. (And he’ll try to run at least once more in the second half of the story.) That’s always been part and parcel with his heroism, in any regeneration: He’ll help, but he won’t stick around. Having him continually try to flee in “The War Games” subtly highlights this, which will be one of the sticking points of his trial. (Not to say he was wrong to run away in any of those instances, two of which threatened certain death and the other certain capture, but even though it’s well-motivated, we’re deliberately left with the image of a hero who’s constantly running like a coward, a tension that’ll have to be resolved. As we’ll see in the second half of “The War Games,” the outcome of the Time Lords’ trial is the Doctor is forced into a situation where he can still fight monsters and aliens, but can no longer run away from the consequences of the battles. Next time, I’ll wrap up the second half of the story, and talk a little bit about a couple of long-simmering canonical questions raised by “The War Games”: Is the War Chief the Master? And was this really the last Second Doctor story, and if not, should it have been? • Anyone else notice an uncanny similarity between the British WWI setting in “War Games” and Rowan Atkinson’s Blackadder IV, also set during the First World War? Terence Bayler’s Major Barrington is a dead ringer for Edmund Blackadder, and the two trench-bunker sets look almost the same to me. Plus, Barrington has a George-like assistant, and both shows also have a pair of antagonistic characters in a bullying general and his officious clerk. • It was nice to see the Doctor use the sonic screwdriver for the simple purpose its name suggests—unscrewing a screw. • And coming up after that, “City of Death,” and visits to the Fifth, Sixth, and Seventh Doctor eras in episodes to be named later.